Noir Saint Laurent is a French marble characterised by the elegant dark color. 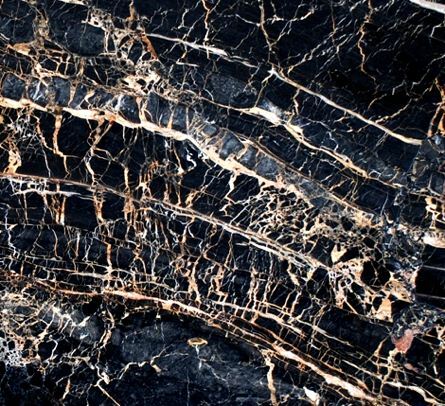 The slabs of Noir Saint Laurent have a black background and many white and golden veins. It is a very fine marble, used for high quality projects. The quarries have a good production of small and medium sized blocks which generally have good availability. The slabs of Noir Saint Laurent need to be resined in order to fix some cracks, defects or porosity which may occur. Ziche vacuum resins three times all the slabs of Noir Saint Laurent with epoxy resins, in the modern factory near Brescia (IT). This top-quality process is possible thanks to the use of the highest technology available, and allows to obtain slabs with a perfect structure, without affecting the natural colour of this marble. Noir Saint Laurent is mainly used for indoor floorings with the polished finishing which enhances its color and veins. Thanks to the important veins, this marble can also be installed with the book-matching technique.